I was having a conversation with a friend yesterday. Not only is this friend someone I care about, but I’m treating his heel pain and big toe arthritis. 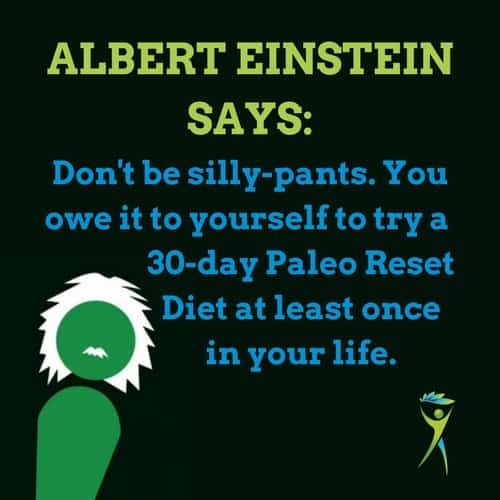 Over the past few weeks, I’ve been writing about this 30 Day Paleo Reset we’re about to launch this weekend. BE SUCCESSFUL: Most people who do these Resets with us have a high probability of completing the diet. GET RESULTS: Those people tend to see weight loss, greater energy and sleep than they’ve ever had before, significantly less digestive distress, and a reduction in their medications or disease symptoms. RESPECT THE BODY: Amazing things happen when the body runs on super-nutritious foods and all potentially toxic foods are eliminated. BIKINI SEASON IS COMING: Who doesn’t like looking good in a bathing suit? This friend had seen my writing about the 30 Day Paleo Reset, but hadn’t said anything to me. I assumed he was uninterested. My stomach has been really bothering me over the past few weeks. It feels bloated and like it’s constantly twisting. At first, I wanted to slap him. Then, I realized that he wasn’t seeing the connection that most digestive distress is caused by eating foods that are toxic to us. ME: Rich (named changed because I didn’t ask his permission to share the story), do you realize that the Paleo Reset we’re about to start next week is for the purpose of eliminating symptoms like that? ME: Do you want to potentially get rid of your digestive distress? ME: Do you want to do the Paleo Reset with us? RICH: Yes, sign me up. No one ignores their heart attack. The body’s giving an obvious enough sign in the form of enormous pain that causes someone to take action, reaching out for help or, quite literally, dying. If we work backwards from the sign of the heart attack, we can see growing and growing louder signals that were unfortunately, ignored. The point in time that someone decides to behave differently is the point where they pay attention to the body’s signs, becoming aware of the health path they’ve been walking down, and choosing to walk a different path. Paying attention to low volume signs is walking the path with grace. Changes to our behaviors are easiest when problems are nipped in the bud instead of letting them fester to sometimes unmanageable proportions. Now, Rich is dealing with stomach distress. It doesn’t matter, now, what is causing his stomach distress. The first step in seeking the solution to his stomach distress is cleaning out the foods he’s eating to see if that changes things. Then, if that doesn’t work, he can work up the pyramid with more expensive options that keep the probability of success the highest (seeing a functional medicine provider). By paying attention to the quiet signs that his stomach is giving him and listening to my promise that a 30 Day Paleo Reset, with a rough probability of 75% chance of success, will relieve his stomach distress, Rich can nip his problem in the bud so that he never has to deal with stomach distress again. That’s what intelligent people like Albert Einstein do. They pay attention more than the average individual. There was an old tenzo (monk cook) washing rice in the heat of the mid-summer day. Tenzo, why are you doing this type of work in this heat? Shouldn’t a younger, less experienced monk being doing this kind of work? MORAL: When you want something done, only you have the power to get it done. And the best time to get that thing done is right now. Right now, you want to get something done for your health. Step #1: You must pay attention and be aware. Without awareness, then there’s no reason to change anything. Step #2: Put the power in your own hands by realizing you’re the only one who can make change. Step #3: Decide and do it. It doesn’t have to be your diet. Most patients we see in our office have had pain for more than a few months to years. It started as a small annoyance they could live with. Then, it escalated in intensity, but they could still living the way they wanted (exercising, doing their hobbies, or keeping on track with their work). Only when it prevented them from doing what they loved to do, did they start seeking help in the form of a chiropractor, physical therapist, MD, or acupuncturist. 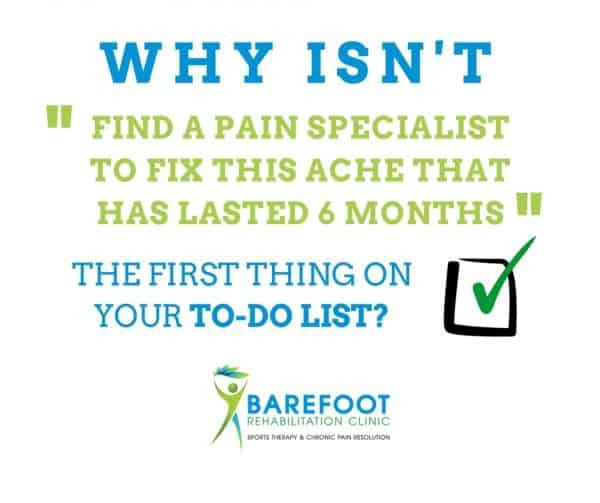 3-5 doctors or healthcare providers later when they haven’t found results based on random treatments with no concrete diagnosis in the first place, they come into Barefoot Rehab. Sometimes, it’s too late to help these individuals. Notice the louder and louder signals in the form of more and more intense pain. What have you been ignoring? What signs are begging for your awareness so you can make a change? Do you know what the change is? If ‘yes’, if not NOW, when? 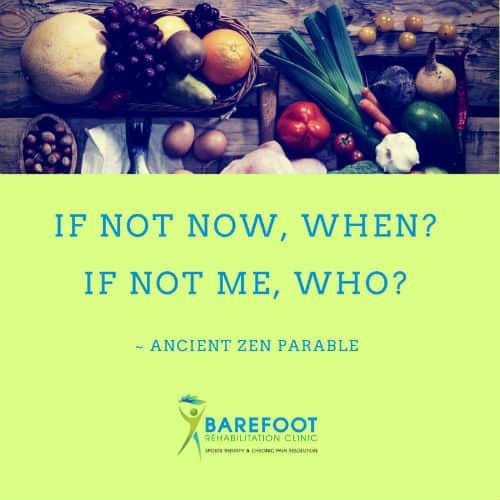 Our practice, Barefoot Rehab, is doing a community-based 30 Day Paleo-Reset. The price is $250 and comes with a 100% Money-Back Guarantee to anyone who sticks to the diet and isn’t satisfied with the results. Take 30 seconds to be still and reflect. Does anything immediately come to mind that you have been neglecting and ignoring in your life? Maybe it’s as simple as a light bulb that needs changing or as big as overhauling your diet? Whatever it is, feel free to share in the comments.